LAHORE, May 9: Hours before a hard-fought election campaign comes to an uncertain end, the man who could become Pakistan’s first thrice-elected prime minister is defiantly upbeat about the PML-N’s prospects on May 11 and downplaying the PTI’s late surge. “The campaign has gone very well by the grace of God. It’s better than in 2008, the response has been better in terms of voters,” Sharif argues, claiming the relative strength of the PML-N has grown from its surprise second-place finish in the Feb 2008 elections. Fielding candidates in all provinces and having struck alliances with nationalists in Sindh and Balochistan, the PML-N has consciously tried to give its 2013 campaign a national hue and shed its Punjab-centric reputation. Sharif himself frequently slips in references to “national” problems, speaks of challenges “the country” faces and repeatedly specifically mentions Karachi, Sindh and Balochistan in his comments. In terms of campaigning too, Sharif has tried to match the frantic pace of Imran Khan and zipped from one rally to the next on the back of a formidable and slick PML-N campaign machinery. When it comes to numbers and predictions, the PML-N president remains cagey, refusing to be drawn into speculation about his party’s prospects on Saturday. “Whichever party wins, it needs to have a very clear majority for it to have the necessary policies to deal with the serious challenges the country faces, for the state to have a strong writ,” Sharif says. Could the PML-N be the party to win a clear mandate from the electorate, installing Sharif as the next prime minister? With the likelihood of any party winning an overall majority seemingly low, which parties could the PML-N form a coalition with, and are there any parties Sharif rules out as a potential ally? With coalition maths more unpredictable than ever, Sharif, like many in his party leadership, shows hints of irritation that it’s his party that has been relentlessly attacked from all sides — the PPP, PML-Q and PTI acting in concert as far as the PML-N is concerned. “So many wrong perceptions about us have been created. The PPP has been at it. Rehman Malik sahib’s false allegations have now surfaced,” Sharif says. The PML-N is perceived as soft on the Taliban and inclined to embrace right-wing parties like the Ahle Sunnat Wal Jamaat (ASWJ) in Punjab — how will Sharif deal with extremism if returned to power? “What Rana Sanaullah did (courting ASWJ support) was resented by the party. He did it in his personal capacity. We were angry about it,” Sharif says of the most notorious link between a senior PML-N leader and the ASWJ. “It is not our policy. It won’t be. Name a single person that we have made a seat adjustment with,” Sharif says, his otherwise calm voice rising a decibel or two. 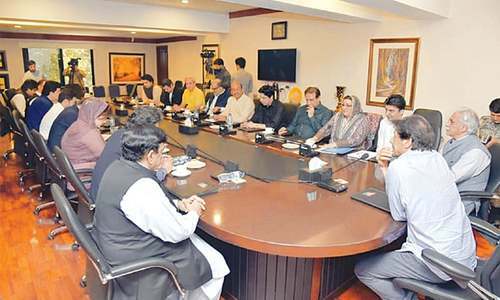 Privately, members of the PML-N leadership remain confident of their party’s chances on Saturday while simultaneously excoriating the PTI for outmanoeuvring the PML-N in the last two weeks of the campaign. “We will be the largest party but it’s the margin that is difficult to predict,” an architect of the PML-N’s campaign said. In a hint of the damage the PTI may have caused to the PML-N in recent days, a PML-N campaign manager lashed out at the media and the PTI’s advertising war chest. “We just don’t have the money to compete,” the media manger lamented, a slightly dubious claim given the PML-N’s deep pockets. “The PTI will have spent more than Rs2bn on ads by the end of it. The Society for Alternative Media and Research, which is tracking political advertisements between 7pm and 11pm on eight major TV news channels, in its report for the week April 25-30 stated: “PTI stands (as) the top political advertiser with highest frequency and airtime in the mainstream private electronic media,” giving the PTI a 39 per cent share of advertisement air time to the PML-N’s 22 per cent. In terms of frequency of advertisements, according to Samar, the PTI had a 32 per cent share to the PML-N’s 26 per cent. (Sharif) in a meeting and gestured as if to say, ‘Well, what about us? Maybe we need something’.” Underlining the closeness of the contest and the importance of the last hours of the campaign, another campaign manager said, “We suggested to Mian sahib (Nawaz Sharif) that the day of not campaigning should end around 7pm (on Wednesday), which is roughly 24 hours since Imran had his accident. That would at least have given us a few more hours to campaign without violating Mian sahib’s pledge. “But Mian sahib said, ‘It’s a matter of my integrity and reputation. We won’t campaign until Thursday’,” the manager said wistfully. What PML N has done for Pakistan. Lahore Islamabad Motorway (others were built during Musharraf era), Lahore ring road, Lahore technology park, Lahore expo center, Lahore underpasses, Lahore airport, Lahore metro bus service, Lahore overheads, Lahore Kalma Chowk, Lahore Raiwind Road (that leads to Nawaz's own palace), 150 billion rupees property in London, 10 star Raiwind palace, industrial empire in Saudi Arabia. Wow. Are you still not ashamed Nawaz. Dear Mr Nawaz Sharif please enlighten us about your 100s of billion rupees properties outside Pakistan. Hey aren't you the same guy who charged the nation with "Qurz Utaro Mulk Sanwaro" scheme and later plundered all that money yourself. People like Nawaz become so shameless. They plunder nation and do corruption many times but still have so shameless gut to prove their innocence and ask for vote. Ha ha ha funny. He announced that PML N will not campaign for 24 hours. He is so ignorant that his brother Shahbaz kept on attending election rallies. Or was that announcement just a making people fool strategy. PMLN and integrity. Thank you for making me smile. Nawaz Sharif thinks he is a royal. He doesn't ask for votes, he just expects them from his slaves in Punjab. Without changing the system one thief will replace the other because the status quo only benefit them not the people of Pakistan. The condition to have election within a party was taken out by an amendment to the constitution approved by both PPP and PML-N. Why! so that they can continue to use their parties for personal benefit. PTI is the only democratic party. They conducted elections in an election year because they were sincere. We need a new system that protect the institutions instead of personalities to benefit common man and PTI is the only party attempting to do just that. Don't be an idealist or pessimist. Go out and do your job. Vote for PTI. why don't he charity his fortune to public, it will automatically solve all of our burning national problem! Internet geeks have won victory on facebook for the Khan even before May 11. You are the same guys , who gave hope to Genaral Sahib to come and save Pakistan and look what happened . Not even two dozen people showed up at airport to support him , because people like you can only do chat .If you are told to go and stay for two hrs in the line, girls like u will prefer to stay at home . My advice to khan would be to take care of his own family, run for councillar elections and try to make decent living for himself instead of begging for charity since 20 years. Mian sahib , inshallah Allah will bless you and our country with GRAND victory. Country Need Imran to make Pak a dynamic nation to stand against evil design of USA and enemies. He has made cancer hospital for surgery of cancer patient but Imran must do surgery yo rotten system to have 24 hrs electricity, people friendly police with participation of public in day to day policing. Make strong infrastructure for all basic needs to finish unemployment for ever.